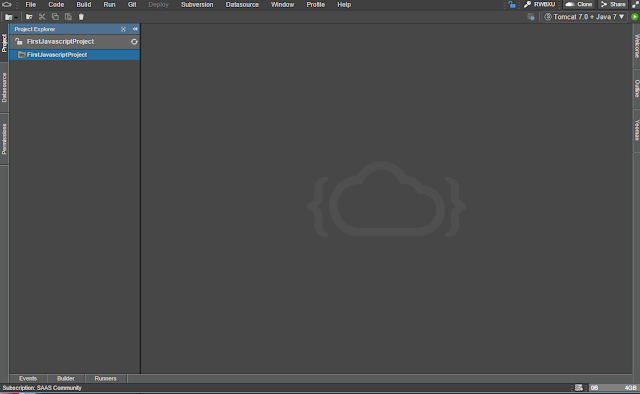 Eclipe Che is an open source "Cloud IDE" created by Codenvy (and currently owned by Eclipse Foundation). I put quotes around Cloud IDE because Eclipse Che can be installed also locally and run like old-school IDE. This is a huge difference to another solutions, which are usually restricted into cloud only. Che requires Java 1.8 and a Docker host to run locally. There is a full installer available at Eclipse Che site. 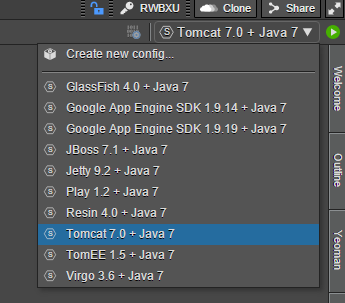 This installer includes Che, Java, Docker, Git Bash and Shortcuts. Very neat indeed. The Che itself consist from multiple different parts like workspaces, docker machines and Cloud IDE, but in this post I'm going to focus on Cloud IDE part. There are plugins for Angular, Grunt, Gulp, NPM, Yeoman and so forth. This is a good set of tools to run modern-day web development at cloud. Where is my window layouting? 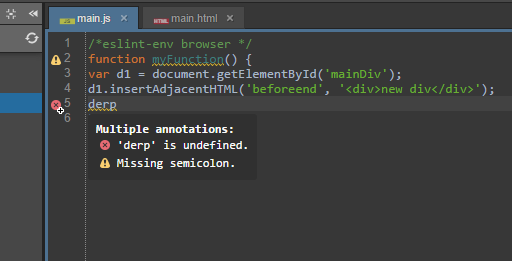 IDE has a tab system for windowing, but I couldn't find any way to set two tabs side-by-side. Double-clicking tab will hide all the other widgets and focus all screen area for clicked tab, but dragging tabs or right clicking them didn't give any option for layouting, not either did "Windows" menu. Che is fast. I mean very fast. It feels faster than my Notepad. This is very important, because lag in typing can easily kill a good vibe in development. Codenvy is a company that offers hosted version (and on-prem version) for Eclipse Che. Company's head office is at San Francisco and they are quite fresh company (founded in 2013). 2) For teams, devops, and organizations, they offer Codenvy On-Prem installation and support. 3) Codenvy On-Prem is also offered with hardware. I call this model as a turnkey model. Pricing starts from Free version and ends into Enterprise SaaS which is priced at 60$/month per user (02/18/2016). Pricing is not around cheapest cloud IDE's, but if you get a good value for a money, then it is justified. The answer for that is more complicated. Sounds like a good set of features to me. Codenvy is currently only company offering Eclipse Che as a hosted service. So if you want to use Eclipse Che as SaaS model or get fully installed & configured on-prem environment, Codenvy is the right company for that. The opinions expressed herein are my own personal opinions. I don't work for Codenvy or Eclipse Foundation. If you have any experiences with Eclipse Che or Codenvy, please leave a comment!